Until recently, the typical retirement plan combined pension and social security benefits with personal savings. However, this plan is more and more unrealistic. Americans dreaming of a worries-free golden age need to consider investing for retirement. This is not some extreme assumption of the media but the clear warning of the U.S. Securities and Exchange Commission. Commissioner Kara M. Stein presented the retirement crisis as a tsunami ever since October last year. In her speech, she explains that the Social Security trust fund’s evolution has been anything but encouraging and the numbers suggest it will be depleted by 2034. Apparently, the United States’ retirement savings gap already exceeded $30 trillion and will continue to grow by approximately $3 trillion/year. As if that were not enough, fewer and fewer employers include pensions in their employees’ benefits packages. Therefore, Americans dreaming of retirement have no option but to sponsor their retirement themselves, through savings and investments. Unfortunately, the 2018 report of the National Institute on Retirement Security suggests that most Americans are nowhere near achieving this goal. Retirement account owners have an average annual income three times greater than that of individuals with no retirement account. The median balance of the retirement accounts of all working-age individuals in the U.S. is $0. Among working individuals who do own one or more retirement savings accounts, the median balance is a modest $40,000. 3 % of individuals aged 55-64 have retirement savings lower than their annual income. 7% of individuals have a lower net worth than their retirement savings target. If you are part of these dire statistics, do not despair. Our guide on investing for retirement can help you recover the lost time and achieve your retirement savings target. But before we discuss retirement investment options, let’s see how much money you need and what retirement savings accounts are available. Most people assume that their financial needs will diminish considerably after retirement. However, this is not necessarily true. It depends on the lifestyle the retiree maintains, on their health condition and potential healthcare needs, on their longevity, and a series of other factors that should be accounted for. It is one thing to continue to live independently in your own home, in a town with low living costs, and a completely different thing to move to a luxurious retirement facility or travel around the world. Some retirees can continue working part-time even during their retirement. Others have such precarious health that they find themselves forced to retire earlier than they initially planned and even require permanent care and/or expensive treatments. Only you can calculate how much money you will need when you retire. Just take into account factors such as longevity, inflation, living and health expenses, etc. If you want an easy solution, you can apply the theory according to which individuals wanting to enjoy the same comfort and lifestyle after they retire will need around 80-90% of their pre-retirement income. There are many different formulas you can use to calculate your retirement needs. We preferred the easy way out and used an online calculator. We’ll discuss the results in detail below. 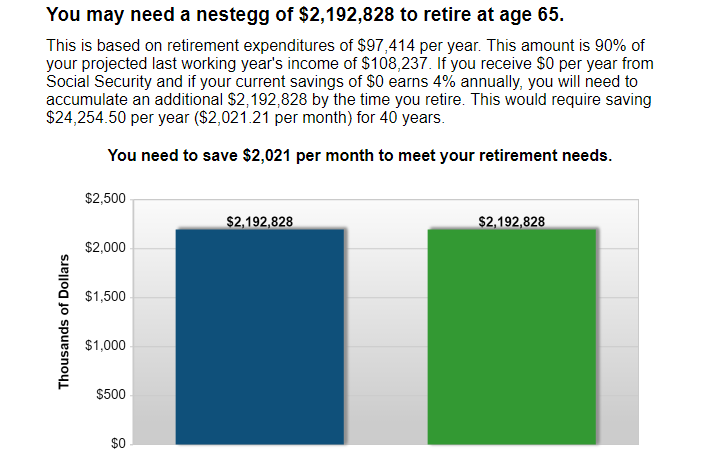 An individual fitting this profile would need to save approximately $1,798,883 for their retirement (see retirement investing calculator screenshot below). This would take setting aside $2,830 a month, namely over 50% of their monthly income. For the return rate, we wanted to take into account a best-case scenario and started from Capital One’s Annual Percentage Yield for IRA Certificates of Deposit, ranging from 2.7% for one year and 3.1% for 5 years certificates. We increased the return rate to 4% assuming there would be better offers out there and the APY would increase with the longer period. Sure, the above example will not apply to everyone. There can be significant differences in starting age, income, marital status, retirement age, initial retirement savings, return rate, potential social security benefits, estimated retirement period, and more. However, the above amounts make it clear that a retirement savings plan will be a burden to any budget. 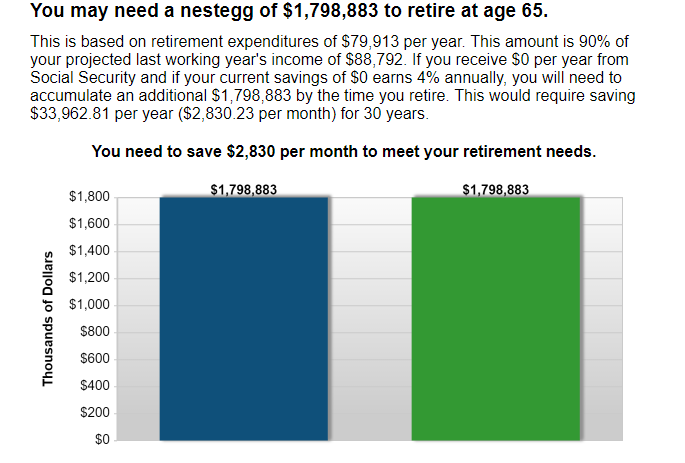 Even someone starting to save for retirement at 25 years of age (40 years of savings) according to the example above would need $2,192,828 to retire (see retirement investing calculator screenshot below). This would require saving $2,021/month, still a considerable amount. The only solution to ease some of the burden is to focus on investing for retirement, not saving. It would be nice to afford to deposit over $2,000 in a savings account every month. However, we all know it is difficult, if not impossible. If it were that easy, you wouldn’t be worried about your retirement and reading this post in the first place. Well, there is an alternative to splitting your income in half and letting one half linger in a savings account: retirement investing. We will discuss retirement investment options later in this post. What matters is that, done right, investing for retirement can be considerably cheaper than saving. To give you an idea of how much cheaper, we used the same calculator and data above but increased the return rate to 8% before retirement and 4% during retirement. 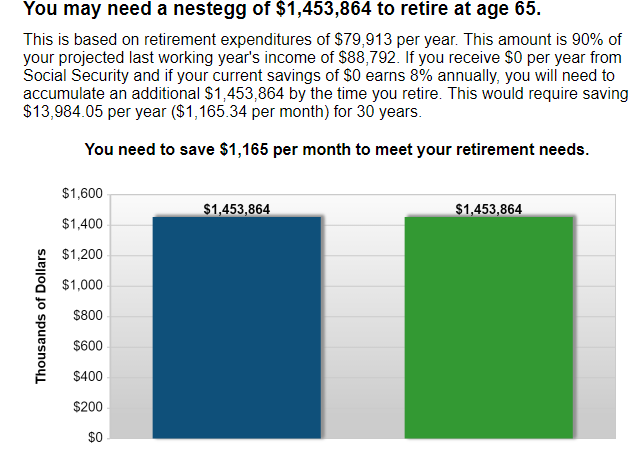 The person in our example above would need $1,453,864 to retire if they start investing for retirement at 35 (see retirement investing calculator screenshot below). This would mean investing $1,165/month, less than half of the $2,830 required if they were only saving for retirement. Someone who starts investing for retirement at 25 under the same circumstances described above would need $1,772,252 to retire (see retirement investing calculator screenshot below). They could secure that by investing only $618/month, around three times less than the $2,021 required if they were only saving. While the retirement investing calculator we used and the situation we described may not be entirely accurate or representative for your situation, they prove without a doubt that any retirement plans should include investments. Before you start researching investment options, and we’ll help with that too, there are a few simple important aspects you should consider. We’ll cover them in the following lines. Investing for retirement while you carry high-interest debts wouldn’t be very productive. You should consider paying out such debts before you begin investing. For example, most credit cards have an Annual Percentage Rate ranging between 15% and 25%. If you invest $10,000, you earn $800/year. However, if you carry revolving credit card debt of the same value, you pay $1,500-$2,500/year as interest. Pro tip: It is easy to get carried away, spend the money you earn, and remain both in debt and with no savings. To make sure that doesn’t happen to you and earn your financial freedom, check out debt-paying helpers like Tally and Debt Genius. Unforeseen expenses appear all the time. Your car breaking down or a water pipe bursting and flooding your home could mess up your budget big time. Without an emergency fund to allow you to cover unforeseen expenses, you will have no other options but to spend your retirement savings or cash in on your investments. Pro tip: Don’t be discouraged if you can only deposit small amounts in your emergency fund or you keep spending it. What matters is to have some cash set aside for emergencies, to avoid spending your retirement savings. Our 13-Tip Guide on How to Save for an Emergency Fund will surely help you reach your goal. If you’re married, living with your children, or in another close relationship, it may be a good idea to discuss your plans with the person next to you. They may be interested in contributing or they may be aware of some high-return retirement investment options. No matter the situation, if they later find out you have been investing for retirement behind their back, your relationship may suffer. This is especially true if you are married and you manage money as a couple. Pro tip: Convince your close ones to join you in your efforts to save money for retirement. If you work together, everything should be easier, from paying your debts to starting the emergency fund and avoiding retirement planning mistakes. While investing for retirement is more profitable than keeping the money in a savings account, it also involves some risk. To lower the risk and have a safety net in case things do not work out the way you want them, it is always a good idea to pursue several retirement investment options and divide your money between two or more savings accounts. Pro tip: Always start investing with low amounts and test several options to see what works for you. Do not close the door on new opportunities. From stocks, dividend stocks, and certificates of deposit to real estate, personal loans, and bitcoin, any opportunity is worth looking into. Not all your investments will pay results, and some will yield higher returns than others. Since it’s your hard-earned money and your future at stake, you cannot afford to adopt a set-and-forget approach. It is very important to monitor your investments and take action according to the results you obtain. Pro tip: With a free personal finance app, you can monitor not only your investments but also your savings, expenses, debts, and more. It will save you considerable time and effort. Now that you know how much money you will need for a worries-free retirement and that a combination of savings and investments is your best chance to obtain it, let’s take a closer look at the savings and retirement options available out there. There are several different types of accounts in which you can deposit your retirement savings. Some provide tax privileges. Others offer no tax benefits but are more convenient to use. There are also accounts with higher returns but subject to various terms and fees. A 401(k) is the retirement account many employers start for their employees, often under the management of finance giants like Fidelity Investment. There are two types of 401(k) accounts. Traditional 401(k) – The money you contribute to it is not subject to taxes, so you can set money aside and pay lower taxes at the same time. For example, if you have a taxable income of $60,000 and you redirect $10,000 of that money to your traditional 401 (k), you will only pay taxes on the remaining $50,000. The money accumulates APY and, when you withdraw it, you pay ordinary income taxes. Roth 401 (k) – You will pay taxes on the money you redirect to this account (in the example above, if the $10,000 contribution is to a Roth 401 (k) account, your taxable income will be of $60,000). However, you do not pay taxes when you withdraw it. Both types of accounts have rather high contribution limits, set at $19,000 for 2019 for contributors younger than 50, and at $25,000 for contributors aged 50 and up. While different accounts have different benefits, when your employer has engaged to match a certain contribution, you should make sure you receive it. To decide whether to contribute more or redirect your earnings to another retirement savings account, assess if your 40 (k) plan has the following features. Minimum 50% employer match. If you contribute 6% of your pay, your employer should contribute at least 3%. Assuming you earn $50,000/year, your annual contribution in one year would be of $3,000, and your employer would have to contribute another $1,500. Auto-enrollment. Enrollment in some 401(k) plans takes place automatically and the employee can start participating immediately. Other accounts have a waiting period and start with lower contribution levels. Low fees. Your 401(k) account will come with corresponding fees, so it is important to have them as low as possible. A comparison of various accounts will help you assess where you stand. Short vesting schedule. This schedule determines how fast you can access your money. You should aim for immediate vesting. A 5-year vesting schedule could be inconvenient, to say the least, if you leave your employer within one or two years from starting your account. Wide mutual funds offer. Unlike IRA accounts, 401(k) accounts offer limited retirement investment options. You should check the funds offered by yours to make sure they have good track records and low fees. Auto-escalation. Some plans increase your contribution gradually, without even you feeling it. If your plan doesn’t offer this feature, you’ll have to monitor and increase the percentage yourself, especially if your retirement plans involve contributing 10% or more. Contribute. You’ll save money on taxes and make your goals of investing for retirement easier to attain. Besides, an empty account won’t yield returns. Make sure you get the maximum from your employer. Their contribution will most likely depend on yours, so the more you contribute, the more they will, too. Don’t keep too much money in employer stocks. Some employers will contribute company stocks to your account. While holding on to some stocks is proof of confidence in the company’s future, the stocks may drop in value and cost you to lose money. Avoid cashing out. Just because you’re changing jobs it doesn’t mean you should cash out your retirement savings, especially if you’re going to spend it. Let it grow, transfer it to your new 401(k) account, or convert the funds into an annuity that you can cash as monthly sums when you retire. Don’t borrow. Whenever financial hardships arise, you’ll be tempted to borrow money from your 401(k). Don’t do it. You will always repay a loan or pay out a credit card, but chances are you will never put the money back into your 401(k). You’ll lose not only the money you borrowed but also the return they would have yielded had you let it grow. Pro tip: Professional 401(k) account management is now more accessible than ever. You’ll save time and money, monitor your account’s evolution from your smartphone, and secure higher returns. Read more about how you can maximize your 401(k) here! As the name suggests, an IRA is a retirement savings account. You can start it with almost any bank or brokerage company. Like 401(k) accounts, they are of two main types: Traditional IRA and Roth IRA. You can find an in-depth comparison of the two here. The most important difference is similar to the one between the Traditional 401(k) and the Roth 401(k), tax-related. Traditional IRAs rely on pre-tax money but their distributions are taxable income. Roth IRAs are funded with after-tax money but their distributions are tax-free. As far limits are concerned, in 2019, they rise to $6,000 for contributors up to 50 years of age and $7,000 for those aged 50 or older. IRA accounts support investments in mutual funds, individual stocks, ETFs, bonds, and more. The Simplified Employee Pension (SEP) IRA is a viable option for the self-employed. Its contribution limit for 2019 is of 20% of income or $56.000. The Savings Incentive Match Plan for Employees (SIMPLE) IRA is a plan for employers with less than 100 employees very similar to traditional 401(k) accounts. The difference lies with the employers’ obligation to contribute. For employees, the contribution limits for 2019 are $13,000 for those younger than 50 and $16,000 for those aged 50 and up. Pro tip: Pay attention to fees and returns when choosing what type of account to open and where. An apparently small difference, of 0.5-1% can end up costing you a couple of years of retirement. Remember that you’ll be paying that additional percentage in fees, or losing that additional percentage in returns for a couple of decades. Online access (not all banks have apps and online platforms for clients wanting to manage and monitor their savings account). Bankrate provides a helpful overview of the best savings account offers and rates in March 2019. Before you open an account, assess your needs and expectations, compare offers, do your math, and try to look at the account as part of the big picture that is your retirement investing plan. Does it add any value or support your goals in any way? If not, you don’t need it? Pro tip: Regular account savings have low APY, usually up to 2.5%, so don’t rely on them to help with your retirement savings. They’re great when you need withdrawal flexibility or you don’t meet the requirements for other types of accounts. Certificates of deposit (CDs) are savings certificates or promissory notes issued by banks and backed up by the Federal Deposit Insurance Corporation. They have a fixed maturity date, restricting investor access to them. They compensate for the limited access to funds through higher APY. Generally, CDs make a better retirement saving option than savings accounts when you have money that you know for sure you will not need to access for a period of up to five years and you want to avoid the risks that come with some forms of investing for retirement. Negotiability – Some CDs (non-negotiable) do not allow transfers, sales, or exchanges. The only solution to recover your money before the maturity date (1 to 5 years) is to cash them and pay the early withdrawal penalty. Negotiable CDs allow selling on secondary markets but can only be cashed at the maturity date. However, they have shorter maturity dates (between 2 weeks and 1 year). Value – There are small (under $100,000) CDs and large or jumbo CDs (over $100,000). Specialty – You can choose between several varieties of CDs: liquid (no or low early withdrawal penalty), bump-up (access to new higher interest rates), step-up (interest rate rising at regular intervals), IRA CDs (held in IRA accounts), brokered (sold through brokerage accounts). Pro tip: If you decide to invest in CDs but you are not sure how long you can wait to cash them, settle for small certificates with various maturity dates. This way, if the need arises, you can cash the CDs with the shortest term and a value close to the amount you need. These are contracts between insurance companies and policy holders. With an annuity, you make regular payments in exchange for a fixed or variable return and regular payments beginning immediately or at a future pre-set date. The payments can last for a pre-determined period (say 20 years) or for the rest of your life. Some insurance policies allow payments to other beneficiaries as well. Annuities can have a structure similar to fixed income investments, like bonds, and add a fixed interest rate to the principal. They can also resemble equity investments and have uncertain growth, dependent on the performance of a certain security index, like the S&P 500. The principal grows tax-free until distribution. There are also a few disadvantages to keep in mind. Annuity purchase commissions can reach 10%. Onerous charges apply to withdrawals before the contract-agreed date. There are also penalties for early withdrawals (before the age of 59 or 60). Pro tip: Never purchase annuities in a tax-sheltered account like IRA. You may only do this after you retire if you want to secure your income for the rest of your life. Now you know how to save money for your retirement, but we’ve already established that saving can only get you so far. It is time you considered investing for retirement, and we’ll help you find the solutions that work for you in the following lines. As you may already know, there are several retirement investment options, each with its pros and cons. Let’s review the most common ones and see what they have to offer. Bonds are basically loans you can give to the government or to corporations. In exchange for lending them your money, you receive a fixed interest rate, usually paid twice a year. While there is always a risk that the borrower will not be able to pay you back, bonds have an associated credit risk that you can use to guide your investments. Bonds are usually issued in $1,000 units. They can be traded but their market value will vary according to the current market interest rates. If the bond’s interest rate is higher than the current market interest rate, its market value will exceed its initial value. If the bond’s interest rate is lower than the current market interest rate, its market value will be lower, to compensate for the difference of interest. Bonds make great retirement investment options because they have a fixed, known return, and their principal is repaid at maturity. Pro tips: Bonds issued by municipalities, states, and few other issuers are not taxed but you should never purchase them in tax-favored retirement accounts. U.S. Government bills and treasury bonds are the safest. Otherwise, to minimize risks when investing for retirement, settle for bonds rated Aaa (Moody’s best rating) and AAA (Standard & Poor’s best rating). Stock prices change according to the company’s market evolution, the actions and perceptions of the shareholders’, and the potential investors’ perception of the company’s future. When the general perception is positive and optimistic, stock prices increase. When the opposite occurs, prices stagnate or decrease. Any decrease in stock prices will translate into losses for the investor. Stock price fluctuations are common and not always justified. This means investors take high risks. The good news is that stocks are traded publicly, easy to buy and sell, transparent, and subject to clear and strict regulations. Most of the times, the risk will depend on the experience of your financial advisor but even the best analysts make mistakes too. If, until last year, the stock market yielded returns of over 10%, 2018 ended on a negative vibe. Pro tip: If you want to try your hand at stock investing for retirement, limit your investments to a small amount that will not jeopardize your retirement plans if you lose it and choose your stock broker carefully. You’ll have plenty of time to increase your investment once you get the hang of it. REITs and MLPs are popular options for anyone considering investing for retirement as they have high cash distribution. REITs may own property, manage it and collect rent, and/or own mortgages. MLPs are common in the energy and natural resources sector. They usually own oil and gas reserves about to be exploited. The great thing about REITs and MLPs is that, unlike corporate dividends, they are not subject to double taxation. Also, they distribute most of their income every year (REITs have to distribute nearly 90% of their annual taxable income). If you invest in this type of partnerships, your return on investment will come from distributions and, hopefully, increases in property or reserve value. Pro tip: Keep in mind that part of the distributions you receive every year will be a return of your capital resulting from depletion and depreciation. If necessary, you can trade your REIT and MLP units just as you would trade bonds or stocks. These funds can be traded similarly to stocks but they benefit from built-in diversification – their active management is resumed to aligning the fund’s performance with the evolution of the tracked index. This limited management requirement translates into low administrative costs. Since they involve reduced trading activity, ETFs produce fewer taxable capital gains and higher returns on investment. They are an excellent solution for tax-deferred retirement accounts and usually have an investment horizon of 10 years or more. Pro tip: Although today’s ETFs can track a wide variety of indexes, including select commodities and junk bonds, the performance of indexes associated with less traded assets is more difficult to replicate. To avoid risks and uncertainty, frequent trade index options are preferable. These retirement investment options have been around for more than a century. They require registration with the Securities Exchange Commission and compliance with the Investment Company Act of 1940. Pro tip: Think twice before investing in mutual funds and study your options carefully. Besides bringing about high management costs, these portfolios have an uncertain market value, closely related to the market dynamic. It is not uncommon for investors to transfer their mutual funds to ETFs targeting the lower management costs, the simpler trading process, and the higher tax efficiency. Cryptocurrency is a currency or digital asset that uses cryptography to allow safe financial transactions, control additional unit creation, and verify currency or assets transfers. If the term doesn’t ring a bell, the name of the most popular cryptocurrency to date, bitcoin, surely will. The great thing about cryptocurrency is that you can get it for free, mine it, or buy it. It is also easy to trade. If you’re worried about bitcoin’s risky evolution throughout the past year, there are many lesser-known cryptocurrencies with promising perspectives. Pro tip: Investing for retirement in cryptocurrency could be a life-changing move, considering the huge return such investments may yield. However, the risks are not negligible either. They are so high that you should only invest small amounts that you can afford to lose and only after carefully studying the market. There are many ways to make money with cryptocurrency but they all require an open mind and willingness to learn. If you like the idea of investing in digital assets but you are worried about the risks, there are safer retirement investment options you can consider. They are called security tokens and they are basically cryptographic tokens backed by tradable securities. They comply with SEC regulations, and they pay dividends, interest, or profit shares to their holders. You can buy them directly from their issuer, on security token issuance platforms like Polymath, Securrency, Securitize, or Harbor, or on exchange platforms like tZero, Open Finance Network, or BankToTheFuture. Pro tip: 2019 is said to be “the year of the security token”. It could also be the year when you start investing for retirement the smart way, with high returns and low risks. Just take your time learning all there is to know about security tokens and related-investments. Now that you have a better idea of what investing for retirement involves, you are probably worried that you will be unable to amass the necessary money. It’s normal. If you stick to the savings accounts and options presented above, you don’t assume risks, but chances are you won’t be able to gather the money you need. On the other hand, investing for retirement is promising yet risky. It could bring the returns you need to reach your retirement goals but you could also lose some of your savings and compromise your future. But what if there were a better, simpler, safer solution to retirement saving? What if you could learn everything within minutes and start investing with a touch on your smartphone’s screen? Guess what: you can! Keeping with up with technology has its perks, and one of them is that you can invest or have others invest for you with just one or several intuitive apps. Your investments can range from stocks and bonds to real estate, cryptocurrency, and more. For example, you can invest in real estate with Fundrise or Roofstock, or in stocks with Betterment and Ally Invest. You can lend money to peers with Lending Club, or make money trading cryptocurrency with Coinbase or Binance. Pro tip: If you want to start your investment adventure safely and with minimum impact on your budget, use Acorns! It rounds up your credit card payments and invests the change in the stock market. You won’t feel it’s working for you until you see the money piling up in your account! Read more about Acorns and how it can support your retirement investing plans here! There are many more apps that take the guesswork out of investing for retirement and bring incredibly high and safe returns. Testing them and choosing the best ones for you may take a little time. However, the high return rates will be worth it. As you advance with your plans of investing for retirement, don’t hesitate to keep us informed of your progress and share the retirement investment options that worked best for you!